WhatsApp is free or paid? How much does it cost? How do you pay? The net has spread a significant amount of false news about WhatsApp fees. Let’s see if you have to pay and in which case. WhatsApp has dropped it’s annual subscription fee. This has been done to expand the number of users which already sits at 1.2 billion. The service is now totally free of charge. WhatsApp believed that the fee was the main obstacle holding them back from further expansion of it’s service. Not everybody has a credit card which makes other free alternatives, such as Facebook Messenger, a threat to WhatsApp. Facebook Messenger has been a threat to WhatsApp being the leader in the stakes as the most used messaging app. WhatsApp’s co-founder, Jan Koum, stated that it will not compensate any money lost through ads. Instead, WhatsApp allows consumers to speak to other enterprises that will more than likely pay for it’s service. Obviously the pre-requisite for users of WhatsApp is to be connected to WiFi or have a data subscription plan through a telecommunications service provider. This becomes more difficult for consumers who are traveling abroad. The net, as you know, loves to have fun. Regarding WhatsApp, hoaxes are many and varied, especially when it comes to money. It seems that for the question “Does WhatsApp cost money?“ you just can’t find a definitive answer. In reality, the answer is simple: it depends. And not on the device on which we have installed WhatsApp – whether iPhone, Android, Windows Phone or other – but on the date from which we started to use the application for the first time. Let’s proceed in order. First of all, we want to clarify some aspects concerning all types of phones. Whether you pay to use WhatsApp or not, to use the application you have to take into account the cost of the Internet connection. Unless you are using a free hotspot, you have to pay for WhatsApp data usage. An internet connection is required to use WhatsApp. Following that, remember that WhatsApp does not have any kind of advertising in it. The company’s policy is clear, and has remained as such even after the “change of ownership”. Well, many will wonder how does WhatsApp make money? Why did Mark Zuckerberg, the owner of Facebook, spend about $20 billion to buy it? Before knowing the truth about the cost of WhatsApp, it is good to “forget” the false news circulating on the web. Things like, ‘From next month WhatsApp will be paid to the cost of …. per month” or “If you do not send this message to 10 people you’ll pay … “. (All of this is false news to try to fool users, and in many cases they achieve their goal). 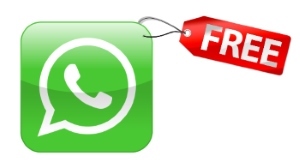 Finally, there are the half-hoaxes that teach you how to get WhatsApp for free. This is only partly true; we’ll talk about that in the last chapter of this post (number #3). 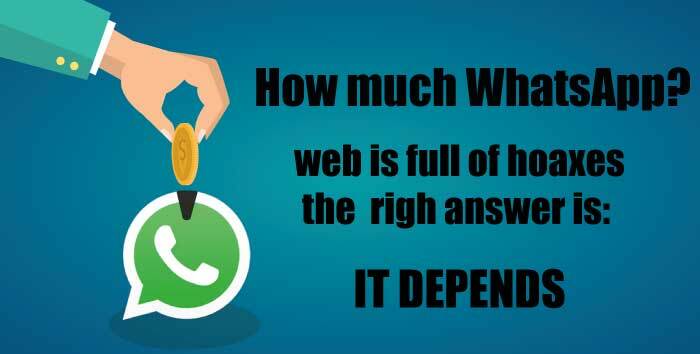 Is WhatsApp free or paid? Let’s get straight to the heart of the issue. WhatsApp is free only for the first year of use for new users. Then, you have to pay to use it at 0.99 USD per year. WhatsApp provides a discount to those whom decide to buy 3-year and 5-year plans. 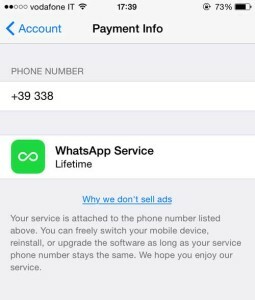 If you buy WhatsApp for 3 years, you pay a total of 2.67 USD. This is the equivalent of 80 cents a year (and therefore 9 cents less than a subscription for one year, with a discount of about 10%). If you buy WhatsApp for 5 years, you pay a total of 3.71 USD, approximately 0.74 cents for EACH year of service (22 cents less than a year, a discount of about 25%). There is a third option that allows users to get WhatsApp free. Many users, when they hear talk of a WhatsApp payment, smile and say, “But I’ve never paid anything to use WhatsApp!”. That’s true, but since 2014 WhatsApp become paid; however, if you downloaded WhatsApp before 2014 you will have it for free forever. P.S. After you’ve paid, it takes about 3-5 days before you’ll see your payment information updated. Before responding, you can know whether you have to pay for WhatsApp or not. To discover the type of subscription you have active on your mobile, go to: Settings > Account > Payment Info. If you find the sentence “WhatsApp free for a lifetime”, you will not be charged, as you have the application free of charge forever. Otherwise, let’s see how to make the payment. Google Wallet: You can pay for WhatsApp service payments through Google. To use this method, you have to register for the service. PayPal, American Express, prepaid: This option is available directly from the application. Just follow the procedure from the “payment info” and enter your account details or card. Send Payment URL: selecting the “Send Payment URL”, you receive an email with the procedure to pay WhatsApp directly from your computer (with a bank account or card). The first way to get WhatsApp without paying, as we have already mentioned before, is to have downloaded the application before it became paid. The second way is to download WhatsApp on different devices – iPhone, Android, Windows – and take advantage of the free promotion for the first year. Not many people, however, are willing to change their phone every year (although it’s enough to change just the phone number). The only real way to have WhatsApp free, therefore, remains that of the “gift”. One of the latest updates of WhatsApp, in fact, is the opportunity to give a subscription to a friend. To do that, just follow option 3 (Send Payment URL) that we have seen above and send the URL for payment to those who want to gift us the app. In this way, our dear “benefactor” will receive the email from which they will make the gift and pay for the application for us. If your helper does not know how to do it, you can share this article on their Facebook wall, so they’ll have “no excuses” related to not knowing how to do so. If you want to discover other methods to get WhatsApp for free, you can look at the article How not to pay for WhatsApp every year.